Seventeen year old Alex Taylor (Richard Harmon) dreams of flying. He also dreams of running for his high school's cross-country track team. 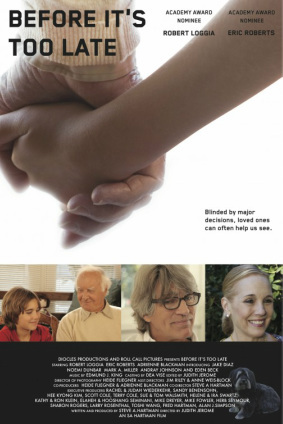 Both dreams seem equally out of reach as Alex has been blind since the age of two. Alex, determined to run, practices with his father, Probation Officer Geoff Taylor. Geoff, with additional girth and age working against him, finds that he no longer can keep up with his son, a gifted runner. He must find a running partner at the school fast enough to help Alex make the cross-country team. This help comes from the unlikeliest of sources. Brad Coleman (Jaren Brandt Bartlett), a schoolmate of Alex's, spends most of his time running from the law. Brad is caught in a pathetic daytime robbery attempt and faces incarceration for repeat offenses. Geoff makes a deal to keep Brad out of jail and back in school. He pairs the two boys, opposite in many ways, together. And despite a rocky start because of their many differences, an unlikely friendship forms. Saturday, Sept 20st 2013 11:00 a.m. - 3:00 p.m.
presented by Ahoskie Chamber of Commerce. In addition to the movie screenings there will be a children's book give away and games and toys to play with and art supplies to let the kids creativity run wild. Still image from Phoenix Medium Rare. A chef who can cook anything can not cook a Phoenix. It's spring again! Worker ants race to carry leaves to their colony. A unique take on the monster under the bed story. A sad little creature in search of happiness. 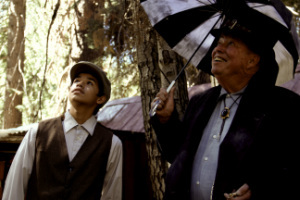 Bragg N East is a Christian, Faith-Based, inspired by true events, original feature film. Robert Wagner has been a police officer in one of the toughest neighborhoods in Raleigh since 2007 and had many life changing events happen to him as a cop. One event changed his life forever. This event caused him to change his tactics as an officer and in return has made his job more rewarding then it has ever been. He learned to use a weapon that he can't carry on my belt....Christ's Love. Bragg N East is a movie about his story and the story of Dae'Quan, a guy who grew up with no positive influences and becomes a hardened drug dealing gang member. The movie follows both lives, a hardened police officer and a hardened gang member, and their fight to a better way of life. There will be an opportunity for a Q&A session after the screening. Shunned by his village, an eccentric old man treks into the woods every day and returns late at night. The only person who is interested is a young boy who follows him on his journey to discover his magical secret. The appearance of a mysterious puppy coincides with the disappearance of donated toys from a charity for children in need. Ruby’s investigation quickly leads to the destruction of a crime scene, the arrest and possible deportation of a beloved refugee, the disappearance of the puppy and then of Ruby’s little sister, Hailey. Ruby Skye is on the case. An elderly man relives his boyhood through a backyard game of wiffle ball with his family. Life and chess are not so different. There is a moment in life where you know you have to make a decision, but the best thing to do would be not to make any move. But... you must. We simply call this being screwed. In chess, they call it Zugzwang. Based in the Nairobi slum of Kariobangi, Box Girls is an organization that works through boxing to instill self confidence in girls living in slums throughout Nairobi, shaping them into the next generation of community leaders. 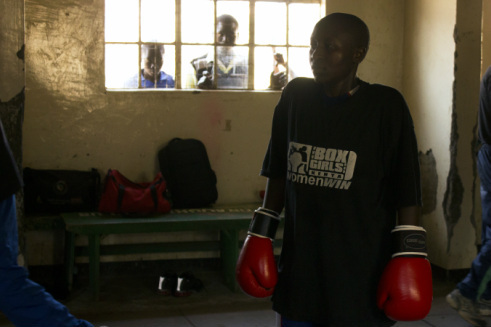 "Box Girl" follows Sonko, one of the earliest Box Girls participants who boxed her way onto the Kenyan national women's boxing team. An original short documentary about fashion photographer Keith Major and his amazing photography he has done over the years. Discover the birth of American family entertainment in this historical silent documentary on the history and significance of vaudeville, from its inception in the 1860's to its demise in the 1930's with the advent of 'talking' pictures. 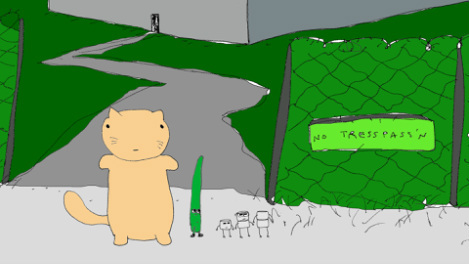 The adventures of a fictional cat (Bubble Bubble Meows), a string bean, and some marshmallow robots as they search for a cure to accidental meteor ingestion. 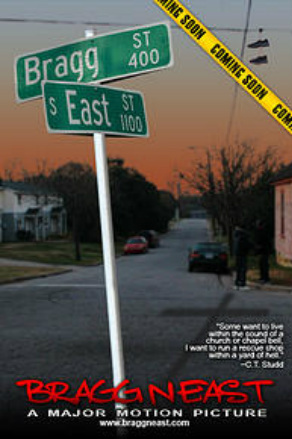 Tina Mabry's first feature film "Mississippi Damned was filmed entirely in Hertford County. Ant was Tina's second episode for the PBS Futurestates series. Chasing Stars is a mixed media stop-motion animation short, made by students at Northwestern University, that re-imagines the story of Laika, the Soviet dog who was the first animal to orbit the earth. Driven by her sense of cosmic wonder, Laika must navigate outer space to find her place in the universe. Nobody knows what the universe is. This super short story about the relationship between the man and the universe will reveal the secret of the universe. As people get older there comes a time when their driving skills deteriorate to the point of being unsafe and they must make one of the most difficult decisions in their lives; to give up their car keys. Alonzo is a Welsh ice-cream man who spends his days working and living inside his van - Luella. When local authorities stop turning a blind eye to his eccentricities, he must find a way to keep both the van and himself from becoming another relic of times lost. 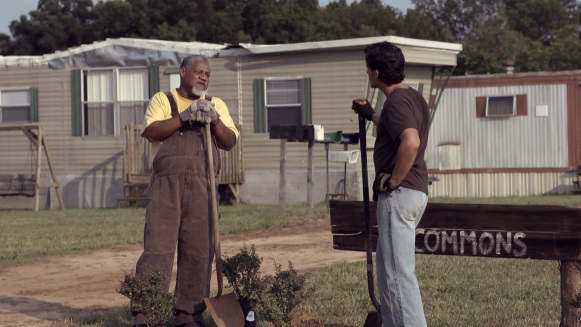 Sunday, Sept. 21st 2:30 p.m.
Production still "Redemption of the Commons. Victor seems to have it all together – good looks, his own brand and marketing company, and life in L.A. But appearances can be deceiving, because in reality, he’s broke, living out of his van, $93,000 in debt and still looking for the ever-elusive purpose of his life. Pop, an elderly friend from the past, offers Victor his only choice – to come back home. Yet, home is a tattered trailer park in the Deep South, which is full of bad memories and broken relationships. Once home, Victor discovers that he must deal with his volatile past before he can move toward his promising future. Through the story’s inspiring ending of reconciled relationships and realized dreams, we are reminded that no life is “common” – and that everyone has a God-given purpose.